The Museum of Modern Art, or MoMA for short, is one of New York City's most impressive museums. Designed by Japanese architect Yoshio Taniguchi, the building itself is as magnificent as its extensive art collection. The large six-story museum is home to many rotating exhibits and permanent art collections, so make sure to plan ahead to maximize your time. While many museums are closed on Mondays, the MoMA is open daily (except on Christmas and Thanksgiving) from 10:30 a.m. to 5:30 p.m. On Fridays, the MoMA is open until 8 p.m. for UNIQLO Free Fridays, when admission is waived. Keep in mind that Free Fridays begin at 4 p.m. and the galleries can become very crowded, so arrive as early as possible if you want the place to yourself. The line to enter MoMA for Free Fridays may appear long, but it tends to move quickly. It's helpful to grab a museum map to navigate the six floors of exhibits. You can also print your own museum plan if you want to prepare in advance for your visit. Museum members can join free gallery talks as well. Topics change frequently and are offered daily at 11:30 a.m. and 1:30 p.m. Groups are limited to 25 people, so it's best to arrive 10 minutes before the tour begins. The coat check service is free (or rather, included in the cost of admission) at the MoMA. Sometimes the galleries can be a bit chilly, so even on a warm day you might want to keep a light sweater with you, but it's a great way to store away any shopping bags or backpacks you might have. Audio tours are also included in the cost of admission. You'll need to leave an ID to get one, but the audio tours are engaging and offer a wealth of insight into the art. They also have a fantastic series of audio segments geared toward children that are interactive and entertaining (even for adults). 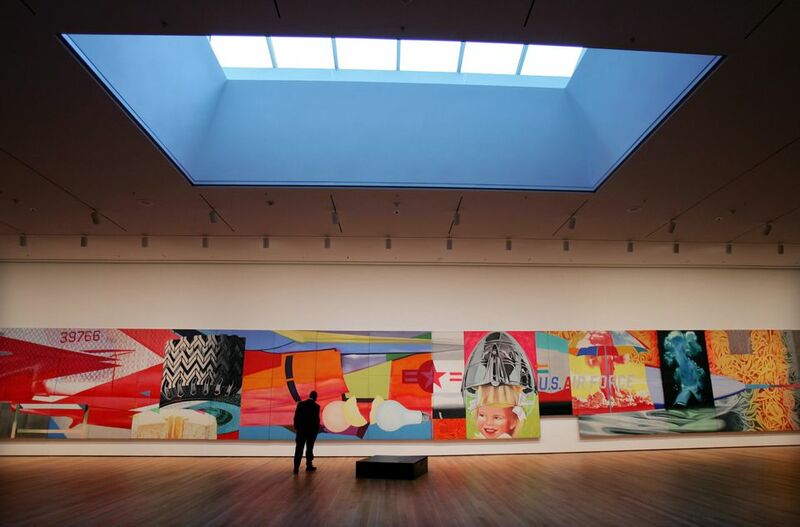 Between extensive permanent collections and rotating exhibitions, there is a lot to see at the MoMA. It's recommended that first-time visitors start on the fifth floor with the Painting and Sculpture Galleries (they continue onto the fourth floor as well). Take the elevator to the top and ride the escalators down as you work your way through the collections. If you want to take a break from the galleries, MoMA offers extensive movie screenings, which are included in the cost of admission. Check out the film and media schedule to see if there is anything that interests you. Movie tickets can also be purchased separately if you don't want to see the rest of the museum. The price of a film ticket may be applied toward museum admission when presented at the Lobby Information Desk within 30 days. MoMA visitors may be surprised to discover that the art museum has some delicious dining options as well. During the warmer months, ice cream from Il Laboratorio del Gelato is served in the Sculpture Garden, and lunch is available in the Terrace 5, a full-service cafe with a view of the Sculpture Garden and the city. For a more serious meal, The Modern and the Bar Room serve top-notch cuisine and drinks. Reservations are essential for dining at The Modern, though not the Bar Room. In addition to the great audio tour for children, MoMA offers ongoing activities and events for children and families. Programs are available for children age four and up. Strollers are permitted throughout MoMA (take the elevator, not the escalators), and the Sculpture Garden is a great stop during any family visit. In the MoMA lobby, you can visit the outstanding gift shop, featuring an array of art-related gifts. From postcards and posters to housewares and handbags, it's a great stop for buying souvenirs. Across the street, the MoMA Design Store also has a wide variety of items for sale that make great presents.